A close examination of five consecutive days of coverage in Denver, Macon and Sioux City suggests that the large, legacy daily news providers still delivered the vast amount of reporting, but the providers beyond those—especially in Denver’s larger media landscape—added a second layer of vibrancy not found in the smaller cities. Indeed, Denver’s constellation of blogs, nonprofit organizations, ethnic media and specialty publications dug into current issues in alternative ways and pushed a range of other subjects into competition for the public’s attention. A larger ecosystem, in other words, is not simply a super-sized version of its smaller brethren. It is also a more diverse one when it comes to who is providing coverage and how. This snapshot analysis also reveals differences in both the news agenda and level of press-initiated reporting offered by the two main legacy providers—the daily newspaper and local TV. Those differences are again the starkest in Denver, where the daily paper’s focus on public affairs issues differed markedly from the breaking news orientation of local TV. In the smaller communities of Sioux City and Macon, the distinctions blur. Just as residents in all three cities turn to local TV at higher rates than any other news source, local TV is in many ways more omnipresent. One reason for this commanding presence is the sheer number of stations in each area. There are three commercial TV channels that serve the Sioux City area: KCAU ABC, KTIV NBC and KMEG CBS. In Macon, there are four commercial stations: WGXA Fox, WMAZ CBS, WMGT NBC and WPGA. Denver has five commercial television properties that report on the region: KCNC CBS, KMGH ABC, KUSA NBC, KDVR Fox and KWGN CW. In addition, all three cities are served by statewide public broadcasting TV stations whose coverage area extends well beyond Denver, Sioux City and Macon. During the five-day period studied, one of these—Rocky Mountain PBS—offered some local Denver coverage on its website. With news programs broadcast at various times of day, a total of 25.5 hours of local news is produced each weekday in Denver by those five commercial stations. In Macon, 14 hours of local news is produced each weekday, and in Sioux City, 11 hours. While some of the day’s stories get repeated across multiple newscasts, the sheer amount of air time on television, still the most commonly turned to news source, plays a central role in defining the stories residents hear about day in and day out. To get a better sense of what the local stations offer and how they are similar or different across the three cities, Pew Research analyzed 35 total hours of local commercial TV news in Sioux City over the five-day period, 40 hours in Macon and 57.5 hours in Denver, plus stories on each station’s website and the website for Rocky Mountain PBS. 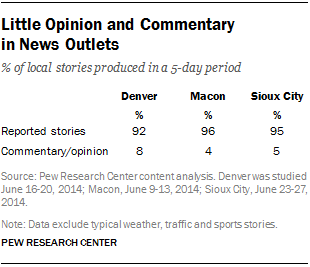 Indeed, in this analysis, more than half (57%) of the news stories studied in Denver came from local TV properties. 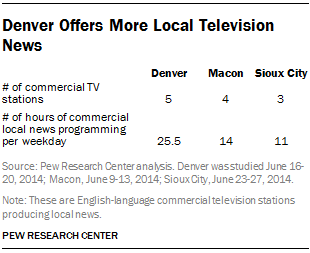 In Macon, 66% were produced by television outlets, as were about half (48%) in Sioux City. The stories that got the most attention from local TV providers tended to be event-driven items with strong visual components. The story that got the most attention from the Denver stations was the disappearance of a 19-year old woman from a Denver suburb. The various outlets produced 50 stories on the subject. It was the third-biggest story for the city’s media overall, but a news item that The Denver Post reported on just twice during the same period. In fact, just one of the Denver TV stories—the skiing injury sustained by swimmer Amy Van Dyken-Rouen—was also a top story in the Post. That was not the case in Macon or Sioux City, where most of the top TV stories were also the top stories in the local paper. From Macon’s local TV providers, residents were most likely to see a story on the Macon-Bibb budget cuts announced that week. This was some of the more civic- and policy-oriented coverage that appeared on the local TV programs studied in this analysis. The stations produced 30 stories in all, 11 of which were packaged pieces and ranged from what parts of the community might be impacted by the budget cuts to reports from a public hearing to a two-and-a-half-minute package on the effect on indigent care in medical centers. The other top stories were more crime- and scandal-driven: the firing of a local official, a robbery that resulted in a death and the scandal involving a local mayor. Sioux City, in the five days studied, was dealing with the fallout of two major weather-related incidents that commanded heavy media attention across the board with the greatest presence of local TV. Severe flooding, the most covered news story of the week, accounted for 16% of TV news stories (excluding traffic, routine weather and sports). Those stories made up nearly two-thirds (65%) of all the stories about the flooding that week. Another way to analyze the attention given to different news events is by the portion of time devoted to that event rather than number of stories. This can highlight when a source may produce fewer but longer stories on a particular subject—or vice versa. In the programming studied here, the list of stories that got the most attention according to time does not differ much from the list of those that emerge in the story count. The greatest difference occurred in Macon, where the attention to the budget cuts stand out even more. In Denver, there was a slight reordering of the top five. For a discussion of the leading stories in each city during the time period studied, see the appendix. Even as local TV stations gave a lot of air time and some online space to the major stories of the week, these broadcasters also devoted their resources to three staples of local TV: weather, traffic and sports. 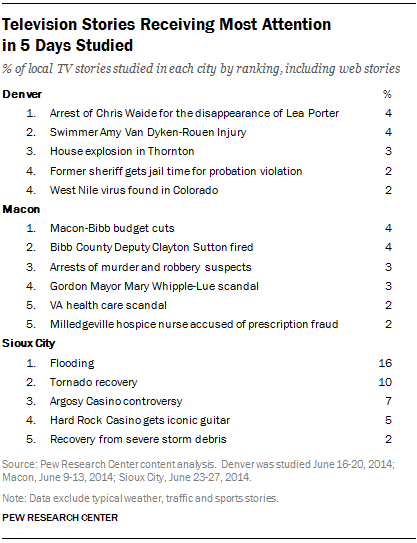 In Denver, 35% of the broadcast and web stories studied were about these routine subjects.38 In Macon, these topics combined amounted to 29% of all stories studied, and in Sioux City, 33%. 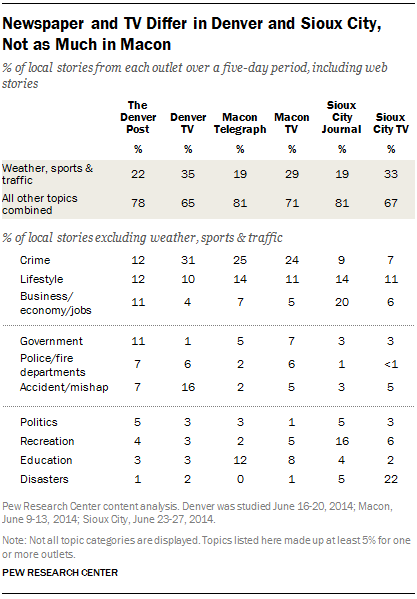 By way of contrast, 22% of newspaper stories in Denver, 19% in Macon, and 19% in Sioux City focused on weather, traffic or sports. We use several measures to get a sense of the investment in newsgathering: what leads them to cover the story in the first place, the format a station uses to air its stories and the length of stories. In the five-day periods studied, stations tended to react to breaking events rather than initiate coverage through enterprise or investigative reporting. In Denver, 31% of broadcast and web stories produced by the TV outlets were triggered by a crime activity (excluding routine weather, traffic and sports), 16% by an accident or some other mishap, and 21% by something that a government agency or official did or said. By contrast, just 4% of stories were initiated by the outlets themselves. In Macon, 41% of stories were triggered by a local government action, 19% by a crime, and just 6% by the outlets themselves. In Sioux City, 23% of stories were triggered by government, 22% by unusual weather events, and 16% by the actions or statements of a business or business leader. Just 7% were triggered by TV news staff. When it comes to how stations report on and produce the stories of the day, the format and length of broadcast stories is revealing (web content is not included here since the unit of measure is different in text-based content than video). Anchor voice-overs—the brief news items that an anchor reads through—made up the majority of their broadcast reports. These reads accounted for 55% of non-sports, traffic or weather broadcast stories in Denver, 62% in Macon and fully 71% in Sioux City. Edited packages—a technique that can allow for more depth but require a fair amount of newsroom resources to produce—were rare. 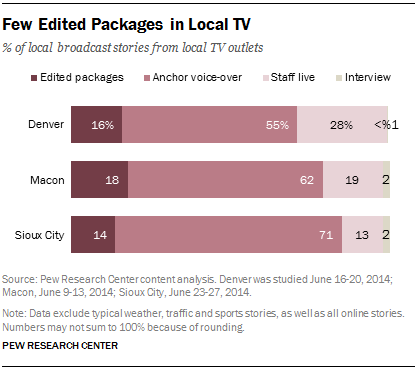 Just 16% of TV stories in Denver, 18% in Macon and 14% in Sioux City were packages. An earlier study of the local news ecosystem in Baltimore in 2009 found that as much as 34% of local TV stories were edited packages (including traffic, weather and sports). And additional research on changes in local TV programming has found a marked decrease in the number of edited packages aired. The reliance on anchor reads plays out in the average length of broadcast stories. Denver stations averaged the shortest stories. Nearly half, 45%, of non-sports, traffic and weather stories studied on local Denver stations were 30 seconds or shorter. That was true of 29% of stories studied on Sioux City stations. Macon stations were far less likely to have the very short stories, at just 17%, though 41% of stories ran between 31 and 60 seconds. 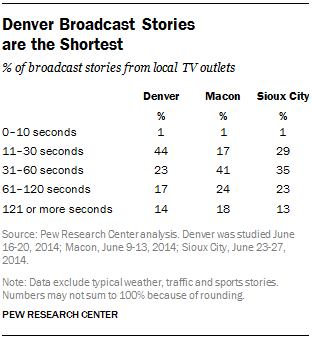 At the other end of the spectrum, only 14% of TV stories in Denver, 13% in Sioux City and 18% in Macon were over two minutes. While much of the content was quite similar from station to station, at least one commercial station’s coverage in each market stood apart from the rest. In Sioux City, during a week that was dominated by severe weather news, CBS affiliate KMEG (the lowest-rated station in the market) devoted far less attention to that topic. Just 15% of KMEG’s coverage was devoted to flooding and tornado recovery efforts compared with more than a quarter on the other two stations. Macon’s local Fox station, WGXA, did not have regular sports segments in its broadcasts. And in Denver, the topic mix of ABC affiliate KMGH was similar to others, but the station produced far fewer packages—just 4% of stories compared with at least 13% across the other stations. A result of fewer packages is shorter stories overall—38 seconds on average for KMGH compared with 57 seconds or more at the other Denver stations. In part because the coverage area of PBS stations is spread across states and regions, local metropolitan coverage was rare during the time period studied here. The local news offerings that were produced, however, stood apart from other local broadcast news. In Denver, the local Rocky Mountain PBS station provided Denver-area coverage on its website—six stories during the five days studied. Rather than cover breaking news, the lengthy stories were generally investigative in nature, the fruits of its recent merger with a regional investigative nonprofit operation known as Rocky Mountain PBS I-News. These stories averaged 1,070 words each, and most of them focused on issues faced not only by the large metro-Denver area, but also the entire state. For example, a June 18 story discussed a new potentially life-saving drug for patients with hepatitis C and how cost issues could prevent its use in Colorado. While Rocky Mountain PBS does not air daily local newscasts, it does broadcast two weekly shows on Fridays —“Colorado State of Mind” and “Colorado Quarterly”—that are devoted to statewide stories. And while Iowa Public Television and Georgia Public Broadcasting offer some statewide public affairs programming on a regular basis, no programs aimed at the local Sioux City or Macon area were found during the time period studied. Earlier studies by the Pew Research Center have found the local newspaper to be both a go-to source for civic news and a community leader in enterprise and in-depth coverage. This analysis of newspaper content (in both print and online) finds a degree of continuity with those earlier findings, but not at levels that set the daily paper as far apart from local TV, or in some cases, from smaller, niche outlets. In addition, the content provided and role filled by each of the three dailies differs from city to city, suggesting, albeit based on one snapshot in time, that cuts in newsroom resources may be having an impact on daily coverage and that in a media-rich environment others may be filling some of the enterprising role. into tended to focus on the institutions and structures tied to public life. Looking at the specific stories of the week, The Denver Post paid more attention to four local issues than it did to any other event or story: the Colorado state primary elections, controversial comments about gun laws made by the governor, a ballot initiative over fracking and drilling, and the legalization of marijuana. Of the nine stories about the state elections, seven focused on fundraising and campaign advertising and in doing so drew on campaign finance reports that had come in earlier in the week. The Post’s marijuana coverage included nine stories during the week (seven of which focused on the policy angle), compared with the total of 15 produced by four different local TV stations. Coverage took several different directions, with one story exploring the impact on child custody cases, others depicting legalization as a campaign issue, and still another tracing the decline of burglaries at local dispensaries. One day, the Post editorial board held a forum entitled “Colorado and Retail Marijuana: How is the New Era Going?” looking back over the first 18 months of legalized pot in the state. The paper’s website featured a 94-minute video of the forum. Indeed, in analyzing the attention by the portion of total space (or words), the marijuana coverage tops the list, accounting for 13% of the total coverage, followed by the controversial mayoral comments at 11% (the spike in attention to the mayor’s comments come from raw video that was included in the online version of the story). In Sioux City, two local news events received substantial coverage from the Sioux City Journal: The paper produced 13 stories in a five-day period on the impact of local flooding—a breaking news story that captivated all the major media outlets in the area (local TV stations produced 95 stories on the subject). The Journal also devoted a fair amount of attention to another story—a controversy over the local Argosy Casino, with six of its eight stories on the topic focusing on the business and economics aspect of the local gaming industry. Finally, in Macon, three stories drew sustained coverage in The Telegraph (and an even greater amount of coverage in local TV). Local budget cuts at the county level became the subject of six different stories during the week studied, with the paper exploring various angles including the impact on local economics, transportation and lifestyle, in addition to scrutiny over the Macon-Bibb government itself. The firing of a local official—Deputy Clayton Sutton—also received play in The Telegraph. Though criminal activity was involved, three of the four stories probed the local municipality as opposed to straightforward reporting 0n the incident in question. The difference in stories covered between The Telegraph and local TV stations was less distinct than that in the other two cities. For instance, a second story The Telegraph gave ample space to was the arrests of local murder and robbery suspects—a straightforward breaking news crime event. In addition to emphasizing different topics than local TV, the major daily papers offered a greater share of stories than their local TV counterparts that were initiated by the news organizations themselves, as opposed to stories that were triggered by outside events, individuals or institutions. Press-initiated coverage does not necessarily equate to investigative or more civic-oriented reporting, but it does suggest a less reactive kind of news coverage, and in some cases, a more enterprising kind of journalism. In The Denver Post, 12% of the stories studied (26 in all) were driven by the newspaper staff compared with 4% among local TV stations—again, not including routine weather, traffic and sports items. Seven of the 26 Post stories focused on civic issues such as government and education.40 In Macon, the divide was even wider, with 17% of Telegraph stories (31 in all) being press-initiated versus 6% among TV stations. Nine of the 31 focused on civic issues. And twice as many of the Sioux City Journal’s stories were press-initiated compared with local TV (14% vs. 7%), with 20 of the 28 stories focused on civic issues. However, some of the other local providers were on par with or exceeded the level of press-initiated coverage offered by the daily paper. In Denver, 22% of stories from cultural publications such as the alternative weekly Westword were initiated by the news organization itself, almost twice the rate of the Post.41 The same was true of 13% of stories produced by the six community newspapers studied here. And while the total number of stories studied were few—just 27—one in three (nine) public media stories were initiated by the outlets themselves. Much less content was produced by the smaller number of nontraditional outlets in Macon and Sioux City, but the tendency toward enterprise work holds true. In Macon, 13 of 20 stories studied in local cultural publications were initiated by the publications themselves. And in in Sioux City, 10 of 50 stories in local cultural publications were press-driven. How “Local” Is the Local Daily? In general, local news providers in the three cities studied overwhelmingly focused their news coverage on a single, specific neighborhood (as opposed to stories about the city or region as a whole). In both Sioux City and Macon, the local daily paper was a leader in this regard. In Denver, however, the major daily was slightly less likely to go hyperlocal, and rather more likely to focus on statewide affairs. In addition to being the state capital, the Denver metropolitan area encompasses about half of the state’s population. A week’s worth of content studied suggested that the Post—by far the largest circulation paper in the state—was responding to both hyperlocal matters rooted in neighborhoods (60%) and statewide affairs (23%). In Macon, by contrast, 82% of The Telegraph’s stories in the space of a week were focused on a single neighborhood, with fewer focused on citywide (3%) or statewide (7%) issues. The Sioux City Journal likewise devoted 84% of its coverage to events and issues in a specific neighborhood or hyperlocal community, compared with 6% on citywide or 8% on statewide affairs. With the days of local newspapers operating bureaus around the United States and abroad largely over, wire services such as the Associated Press now fill pages and websites of local newspapers with coverage from afar. A week’s worth of news in the three local daily papers studied here suggests that by and large, the major daily paper still “owns” its coverage area. 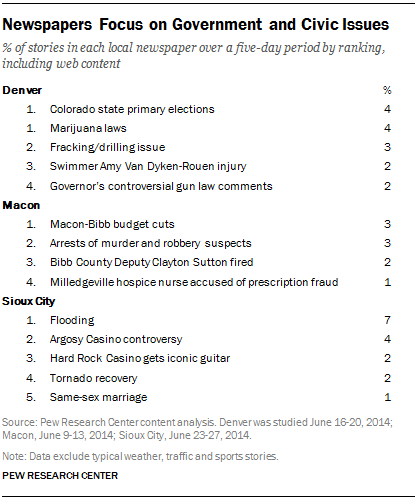 In Denver, just 2% of the bylines in all of the Post’s local stories came from a wire service. In Macon, the share was similar, at 3%. But while a large majority of the Sioux City Journal’s local coverage in the five days studied was produced by its own staff, a notable 15% (a total of 30 local stories) came from a wire service, and appeared only in the print edition. These stories covered a range of topics: About half focused on breaking news and lifestyle issues, while the other half dealt with more civic-oriented subjects such as government, politics and local economics. Just five of the 30 wire stories addressed the major news events in Sioux City that week: the tornado recovery, flooding, and the Argosy Casino. Many of the stories were focused on regional events or issues rather than ones specifically tied to Sioux City proper. Perhaps reflecting the fact that the Sioux City area sits at the nexus of three states, 23 of the wire stories contained datelines from neighboring Nebraska and South Dakota. Beyond mass legacy outlets, Denver’s news landscape stands out for a wide mix of community-based, web-only and niche-focused producers. Forty-four different outlets of this type were included in the study, including eight aimed at minority communities, three trade publications, multiple lifestyle magazines and even a website devoted entirely to the coverage of marijuana. That compares with only six such outlets in Macon and 11 in Sioux City. Over the week studied, that amounted to 778 news stories about Denver (excluding routine weather, sports and traffic) produced by these nontraditional or specialty outlets—more than 1.5 times as many produced by similar outlets in Sioux City and about six times as many as in Macon. And within this group, the Denver’s 14 digital-only outlets produced 73 unique stories over the five-day period, while there were no such digital-only outlets in Macon or Sioux City that were active enough to meet the criteria to be included in this study. While in each city, the large, broad-interest news providers (daily newspapers, broadcast TV and commercial radio) accounted for the bulk of the coverage studied, these specialty outlets still left an impression. In Denver, slightly more than a third (35%) of stories during the five-day period came from specialty outlets—a similar proportion to that of Sioux City (37%). 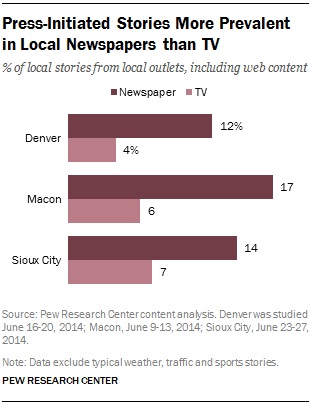 In Macon, the proportion of stories coming from these kinds of niche outlets was smaller, 11%. When it comes to what gets covered, the specialty outlets had a vastly different news agenda in Denver than the broad-interest legacy news providers (newspaper, TV and commercial radio). Crime and accidents made up more than 40% of the stories studied in Denver’s broad-interest media, compared with just 10% among these specialty news providers. Conversely, the specialty sources as a whole spent more time during the five days studied on issues involving local culture such as recreation (10% vs. 3%) and restaurants (7% vs. 1%). There were large differences, though, within this group of niche sources. The outlet that produced the most stories, for example, Westword, a website and weekly print publication that “both covers the cultural scene—and uncovers where the deals are going down,” produced 107 articles about the cultural and recreational activities going on in the city. The Denver Catholic Register, a newspaper produced by the Denver Catholic Church since 1900, produced 35 stories, while the nonprofit website covering Colorado’s school systems, Chalkbeat Colorado, contributed 18 and Out Front Colorado, one of the oldest LGBT-focused newspapers in the country, published 20. 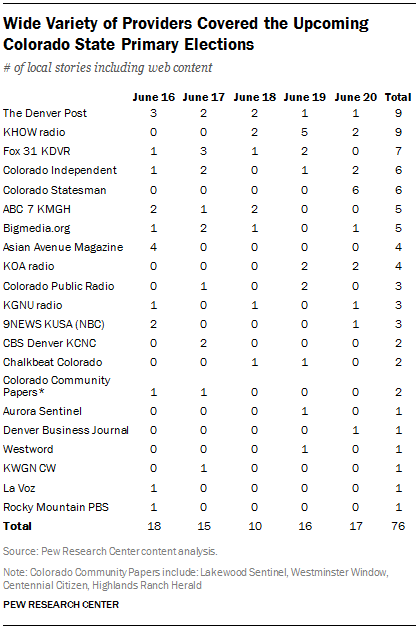 Perhaps the best way to illustrate the role of these specialty news providers in Denver is to examine the largest single story over the five days studied—the Colorado state primaries. Primaries were being held on June 24 for governor, U.S. House seats, state Senate seats and the Colorado State Board of Education. Unlike most other major story threads, especially in Macon and Sioux City, local television did not drive the coverage. In fact, 20 different news providers produced stories over the five-day period, more than any other Denver story. Almost half of all of the election stories (34) focused on the gubernatorial race, while three highlighted the race for seats on the Colorado State Board of Education. The Denver Post produced nine stories on the election during the five days studied, most of which focused on the amount of fundraising that was conducted by various candidates. And the Post’s website included a page devoted to local politics, which was a major location for news on the election for consumers. Of the 18 stories on commercial television, seven came from one station, Fox 31 KDVR. Most of the eight stories that appeared on television (as opposed to an affiliate’s website) were limited to anchor voice-overs; just one (aired on KWGN) was an edited package. And of the 10 TV stories found online, four came from a wire service. It was radio, though, that stood out during the time period studied for being the only segment of the media to present interviews with any of the candidates. Conservative talk show host Mandy Connell’s show on KHOW aired eight segments, six of which were interviews with three of the Republican gubernatorial candidates—Bob Beauprez, Scott Gessler and Mike Kopp. And KGNU radio offered aired a discussion between two Democratic candidates for the State Board of Education. Several stories from niche news outlets offered a different angle than those in the mainstream media. The June issue of the monthly Asian Avenue Magazine featured a “Get Out the Vote” design on its cover and devoted five of its 32 pages to four separate election-related stories—three of which were geared toward the Asian American community. One of these highlighted an analysis of the Asian-American electorate, another featured a statement of why it was important for Asian Americans and Pacific Islanders to get involved in elections, and a third focused on an Asian-American candidate for the U.S. Congress from Colorado’s 2nd District. The online nonprofit Colorado Independent and the Colorado Statesman, a weekly nonpartisan political newspaper, each offered six pieces on the election. These two outlets offered stories that were much longer on average—706 words for the Statesman and 1,238 words for the Independent—than other text-based stories studied. The longest piece from the Colorado Statesman was a 1,250-word, three-page article focusing on Democrat Ed Perlmutter as he kicked off his campaign in Wheat Ridge for a fifth term in the U.S. Congress. This piece was accompanied by 16 photographs from the congressman’s campaign. And the second-longest (around 1,500 words) provided a detailed examination of how the defeat of U.S. House Majority Leader Eric Cantor and the issue of immigration reform might impact the 6th District race between Republican Mike Coffman and Democrat Andrew Romanoff. The Independent’s longest piece (almost 3,000 words) was an article that combined descriptive text with a 10-minute video produced by reGENERATION Colorado, a millennial generation political advocacy group. The video took viewers along on a visit to the homes of three of the four Republican gubernatorial candidates. While Sioux City is a smaller media market than Macon, its news ecosystem is in some ways more diverse, with a slightly higher number of specialty outlets serving its population and a greater share of a week’s worth of coverage emerging from those outlets. In Sioux City, the top local story during the week of analysis—severe flooding in Iowa and South Dakota—was covered heavily by all the major media outlets. Here, though, community weeklies offered some additional coverage of satellite towns that were affected by the floods. All told, 10 stories appeared in weekly papers from Dakota, Akron, Le Mars and North Sioux City—nearly as many as appeared in the Journal (13) on the subject. And in the wake of another severe weather event—a tornado that touched down in Pilger, Nebraska—the local Hispanic weekly paper, Mundo Latino, added two stories on the tornado, in Spanish. 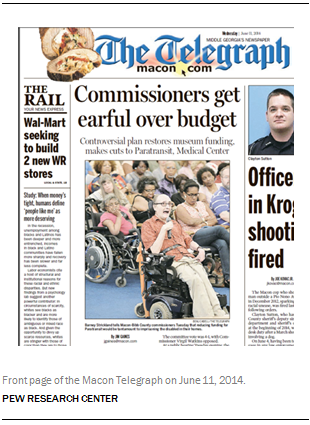 One of the biggest stories in Macon during the week studied were budget cuts at the county level. While this was almost entirely a TV and newspaper story, the local alternative weekly, 11th Hour, published an 800-word op-ed by Macon-Bibb County Commissioner Larry Schlesinger. He said that the county had to make cuts to comply with a balanced budget law passed by Atlanta. While Schlesinger defended some of the cuts, he made clear that he wished the cuts did not have to be made. With the growth of ethnic populations in the U.S. over the recent decades, particularly among Hispanics, there has also been an increase of publications aimed at those audiences. Spanish-language media has undergone a large evolution that has altered the country’s overall media environment in major ways. Large media companies have moved aggressively into certain local markets, which has created more options in cities with large ethnic populations. By contrast, Sioux City only had one such publication—a Spanish-language newspaper called Mundo Latino. In Macon, despite the large number of African Americans, no media outlets were aimed specifically at that community, aside from the Georgia Informer, which publishes infrequently. In Denver, these ethnic publications offered a different news agenda from the leading news outlets in three major ways. First, a number of topics were covered more in the ethnic outlets. Education (9%), religion (8%) and immigration (6%) were among the largest subjects covered by the ethnic press (excluding stories about routine weather, sports and traffic). Second, ethnic publications stood out for their outreach to readers. Some 44% of the ethnic stories studied included information about how a reader could participate in some activity. For example, the Telemundo affiliate KDEN had a number of stories about local fans celebrating the World Cup, and they included options for viewers to send in their own pictures to be aired or posted on the KDEN website. Univision affiliate KCEC aired several stories about a program at the Denver Civic Center to encourage residents to get active. 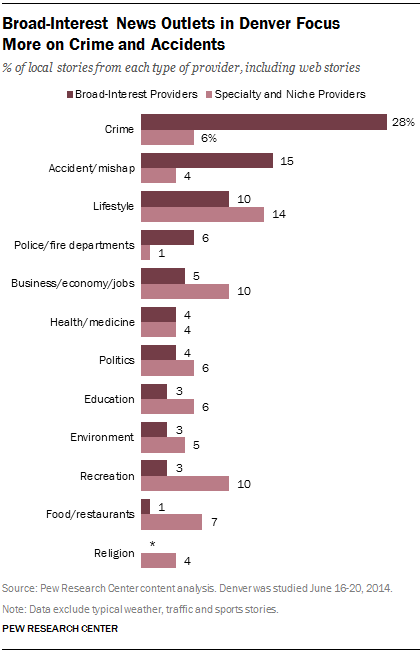 The non-ethnic publications in Denver did not include as many of these types of connections with viewers. In The Denver Post, for example, only 5% of the stories included such information. Third, ethnic publications were even more focused on the local community than most other publications, both in what was reported and where those reports came from. Fully 81% of the stories in the ethnic media were about events in a single neighborhood, as opposed to issues that involved the entire city or state. In The Denver Post, that share was 60%, while on television platforms, it was 76%. And the datelines for the ethnic publications—the locations where the stories were reported from—were much more centralized. 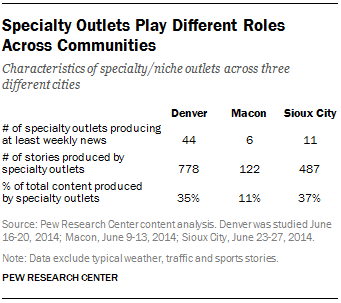 In these outlets, 94% of the stories originated from Denver itself. In The Denver Post, 81% came from Denver and 18% came other locations throughout Colorado. For the TV stations, 80% were from Denver and 19% were from other Colorado locations. Beyond the Denver City line, the greater metropolitan area extends to a number of densely populated suburban communities. Researchers identified 28 community newspapers in the Denver area, the vast majority of which serve this outer suburban ring, including a daily paper serving the town of Aurora (the rest are weeklies). In addition, researchers identified and studied 19 municipal websites outside of the city that were regularly producing news updates about their communities. While these municipal sites were not included in the content analysis—which was limited to outlets whose primary role is that of a news provider—they are described here to offer a sense of the role they play in these communities’ information environment. To learn more about the kind of local news these suburban communities have available to them, researchers focused on a sample of news providers from four of the largest communities surrounding Denver: Lakewood in Jefferson County, Westminster in Adams County, Centennial in Arapahoe County, and Highlands Ranch in Douglas County. Lakewood is served by a community paper—the Lakewood Sentinel—as well as a municipal website operated by the town. As with the other weekly papers studied, the Sentinel publishes a print edition weekly but updates its website several times per week. The four weeklies studied here share a common owner and thus share some overlapping coverage. During the week of June 16-20, the sample period used by researchers, the Sentinel covered a local bill signing, the election of a new county superintendent and a local crime initiative. The city of Lakewood, during the period of analysis, was updating its website home page with news updates a little less often than once per week. During the week of analysis, the site had posted a notice soliciting tips on a homicide case, while the other items focused on announcements such as office closures or a new class being offered. Westminster’s weekly paper—the Westminster Window—covered the expansion of a local park, a city announcement about irrigation audits and a local hockey benefit game. The town’s municipal website was updating its home page with news items several times a week during the time period studied. During the week of analysis, the site published a release on the news that Westminster had been named the “state’s top solar friendly city” and an announcement that an electrical project had caused a water outage. Centennial’s paper, the Centennial Citizen, covered aviation week and a local school library and spotlighted a local Special Olympian. Its municipal website at the time of study had posted information about upcoming events. Finally, the town of Highlands Ranch is served by the Highlands Ranch Herald, another community weekly owned by Colorado Community Media. During the week of study, the Herald covered local issues such as the status of a football camp, an upcoming art show, a lawsuit and a local commissioner vacating a seat. The town’s municipal website during the time of study was advertising promoting an upcoming ice cream social. The town also offers a quarterly print newsletter focusing on community issues. In each of these communities, municipal websites communicate important information beyond news updates. The sites connect residents to local services and resources as well. The relatively small amount of local news available on public radio in each city served more of a supplemental rather than primary role. As is true with most types of news outlets, Denver had more original reporting than the other two cities. Colorado Public Radio (CPR) offered listeners a different type of in-depth reporting that was not found elsewhere. These broadcast and online stories were much longer than most news available on other types of providers. The average CPR broadcast interview lasted more than 13 minutes, while the average online article was more than 1,800 words long. On June 18, for example, “Colorado Matters” included a 13-minute interview with the author of a book about Alan Berg, a Denver radio host who had been killed by a white supremacist 30 years earlier. In Macon, the headlines stories on NPR affiliate Georgia Public Radio were focused more about the statewide issues than they were about Macon. During the week examined, one-third of these local headlines were about weather, and 87% of the rest were about Georgia state issues as opposed to local happenings in Macon. These headlines were short—the average length was 29 seconds—and the same stories were often repeated each hour or the next day. The stories were heavily focused the state legislature as two-thirds of the non-weather stories were triggered by a government action. KWIT, the NPR affiliate located in Sioux City, was similar. The station’s local content also appeared during the breaks of the national shows. These headlines averaged 35 seconds in length, and nearly two-thirds (62%) were reports about weather. 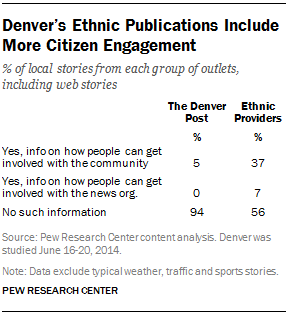 While Denver’s ethnic media offered a number of ways that citizens could get involved with their community or the news organization itself, the overall media did not include everyday members of the public in the news-producing process in many ways. In all three cities, the general relationship between the news outlets and citizens was similar: Citizens are a part of the news process, but only in narrow ways. Non-journalists had very little opportunity to produce or write stories. In all three cities, no more than 1% of the local stories were written by members of the general public. Instead, across all three cities, more than nine-in-ten stories were written by staff. This includes digital platforms. Citizens, then, had few chances to express their thoughts on issues without a filter, or to act as citizen journalists. A number of websites included places for readers to submit news tips, such as the CBS affiliate in Denver and the Macon Telegraph, but those tips went to the organizations and were not available for the public to consume directly. Citizens were often quoted in stories, but within narrow limitations. 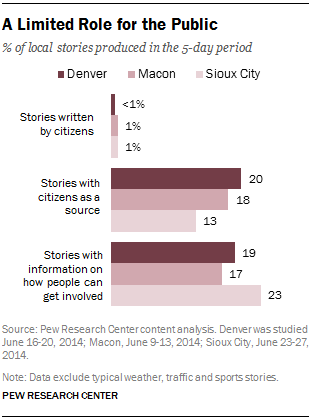 In Denver, one-fifth of the stories cited a citizen as a source, mostly as a witness or bystander to an event. In these stories, the comments from the general public are included in a way that is constructed by the reporters or editors. One way that media engaged citizens was by requesting that their audience perform some sort of action. In all three cities, roughly one-in-five stories contained information on how a reader could take part in some activity—either with the news organization itself or with a group in the community. In Sioux City, for example, these requests appeared most often in stories about severe weather and cleanup, recreational news and charities. A story about flooding damage from the Sioux City Journal’s print edition on June 23 asked readers to visit the paper’s website for the latest weather forecast. Another story from KMEG CBS on June 26 called for volunteers to help clean up a community farm after flooding damage. For the TV outlets in Sioux City, these types of requests appeared more often on their web stories (37%) than on their broadcast pieces (24%). A quality of local news shared by all three cities was the relative lack of commentary and opinion about local events. Denver (8%) had a slightly higher percentage of opinion-based stories than the other cities, but the differences were small. The overwhelming majority of those opinion pieces in Denver (91%) were written by staff writers and editors. The Denver Post had the most opinion pieces with 29—most of which were staff editorials with a few letters to the editor. The second highest number of opinion pieces appeared on KHOW, the talk radio station that featured commentary from its talk show host and some calls from listeners. The low amount of opinion and commentary in the local press is in contrast to trends in the national media. With cable news, talk radio, blogs and social media, the national trend is to include more opinion and interpretation in information providers. However, that trend does not seem to have taken hold on the local level.